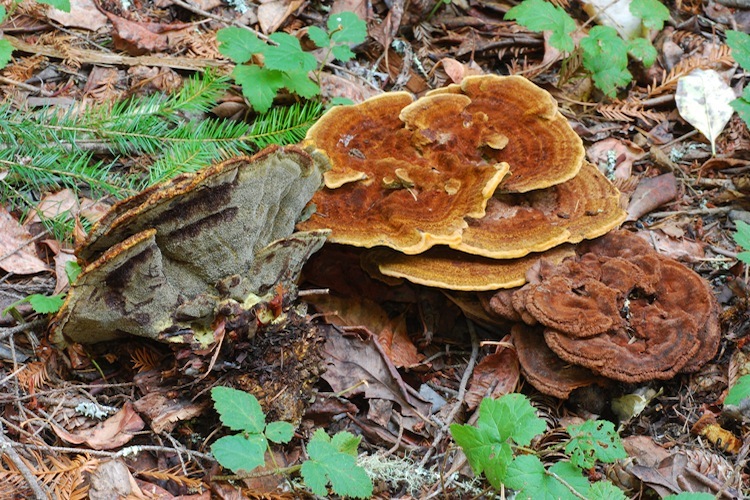 Phaeolus is represented by a single species in most of California, but it is an exptremely common, conspicuous, and commercially important parasite of Douglas-fir and pine trees. It appears to be a fairly weak parasite, affecting both the trunk and roots of infected trees, but can weaken hosts to the point that they blow over in storms. Only Phaeolus schweinitzii occurs in our area. Identification is straightforward, but it might be confused with Onnia triquetea, which grows primiarly (only?) with pine, and which produce fruitbodies with golden-tan caps, and very pale pores. Fiber enthusiasts value Phaeolus for the yellow, golden-brown, and green colors that it can impart to wool and silk.